Every time we travel, we have certain expectations for how the trip will play out, things we want to see. Luckily, there are usually also a few wonderful surprises that we could have never expected to stumble on. 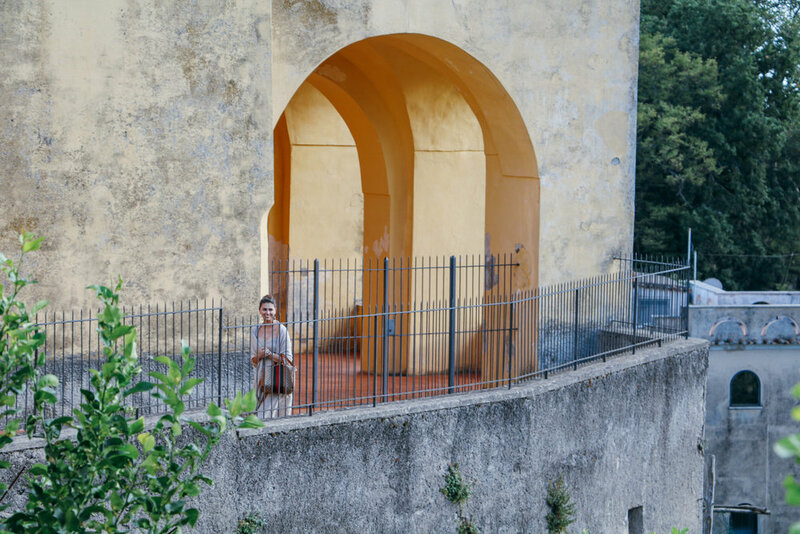 One of the best surprises during our stay in the Amalfi Coast was when we decided to venture past Positano and visit its neighboring towns to the south. 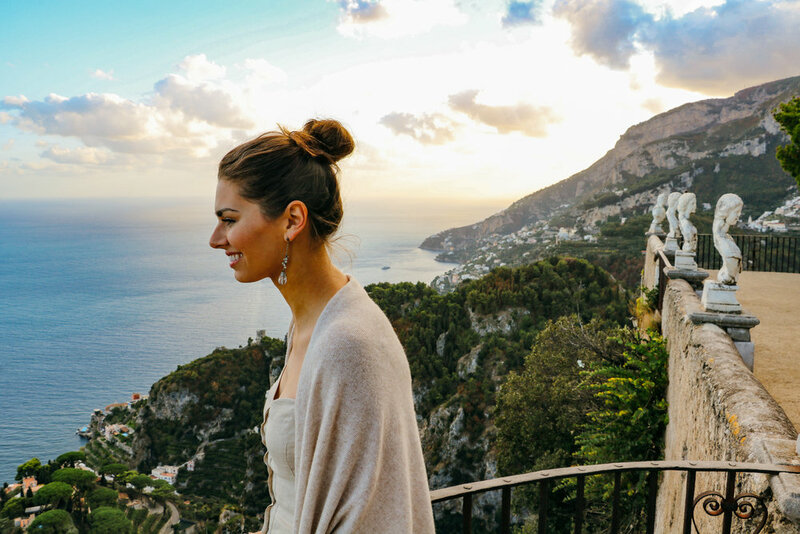 What started as a taxi ride to Amalfi for lunch turned into a full-day excursion with our driver, David, insisting we end the day in Ravello. 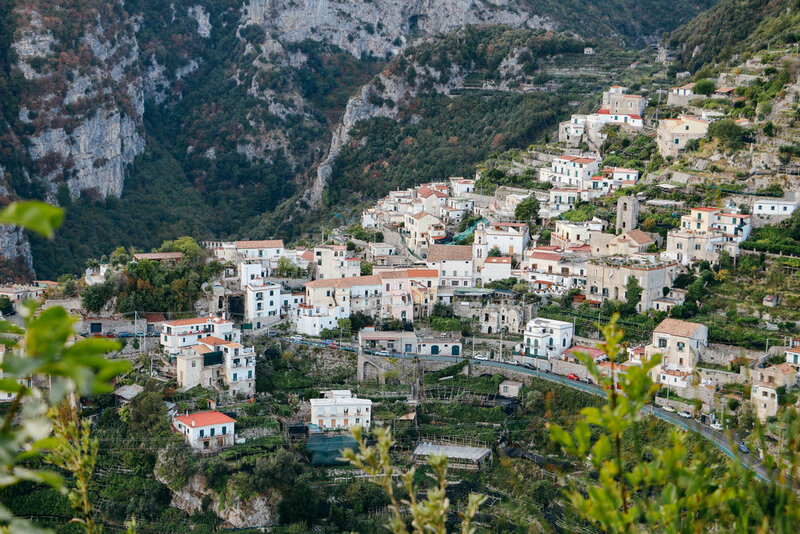 We were hesitant at first as driving on the region's iconic roads is never a quick trip - as anyone who has been to the Amalfi Coast can attest to - and the seemingly short four miles from Amalfi to Ravello would be anything but. However, his praises of this small town persuaded us to go and we're so glad we did! 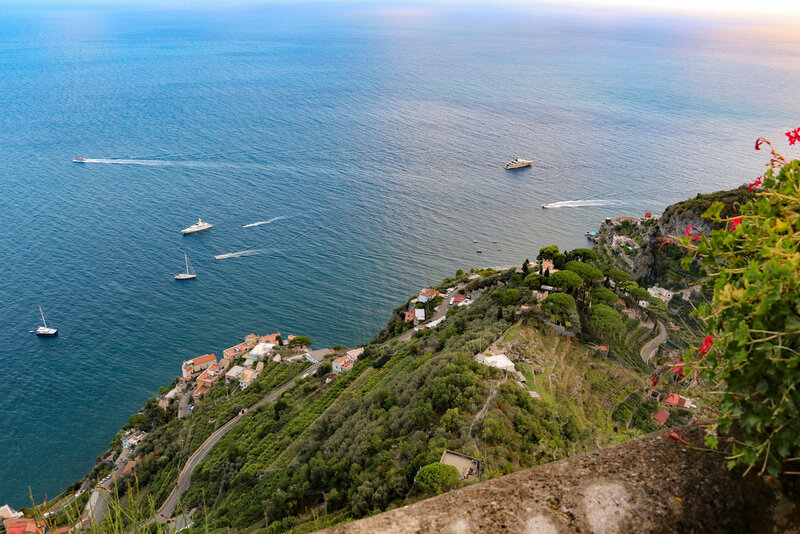 Unlike the other cities along the Amalfi Coast, Ravello is perched on cliffs high above the sea. It feels less touristy than other parts of Amalfi, offering an authentic Italian experience that's very charming and peaceful. It's the type of place where you want to spend all day sitting outside a cafe simply enjoying life without a care in the world. We arrived early in the evening with only an hour to explore, and David told us the one place not to be missed was Villa Cimbrone, so that's where we headed. We meandered through cobblestone streets taking in the town's charm and character, passing old churches and small houses, stopping frequently along the way to take in the stunning views thinking there's no way it will get better than this. Yet walking on these narrow roads grew more pleasant every step of the way, making the ten minute journey to the villa alone worth it! 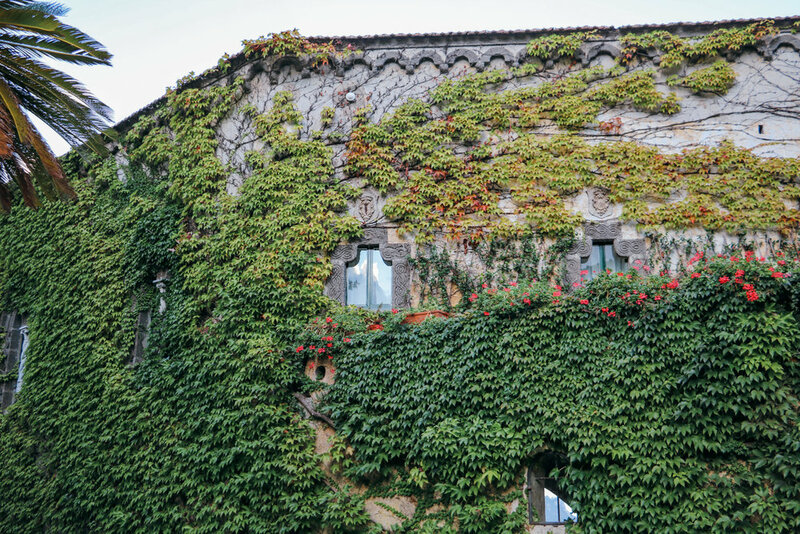 Eventually the road led to the end of town where Villa Cimbrone, a medieval-style estate surrounded by ivy covered walls and large wooden doors, greeted us with open arms. 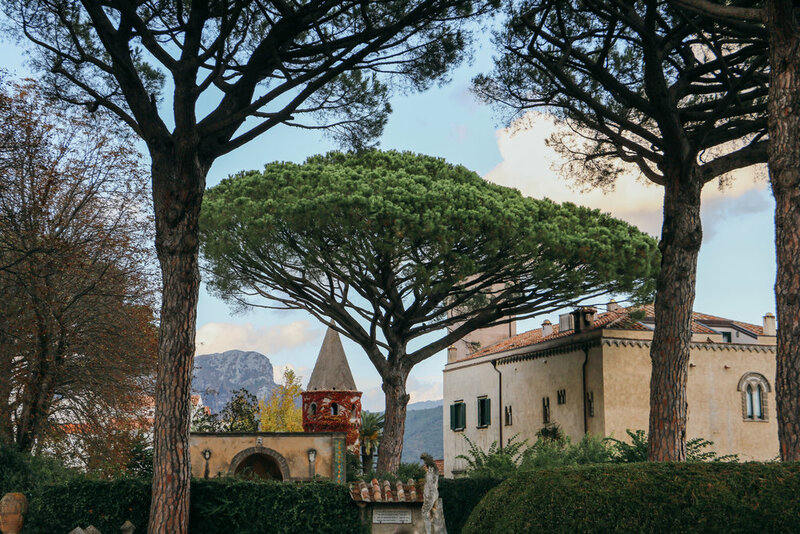 Built in the 11th century and then redesigned at the start of the 20th century, the Villa Cimbrone gardens are considered among the most important examples of English landscaping in Southern Europe. 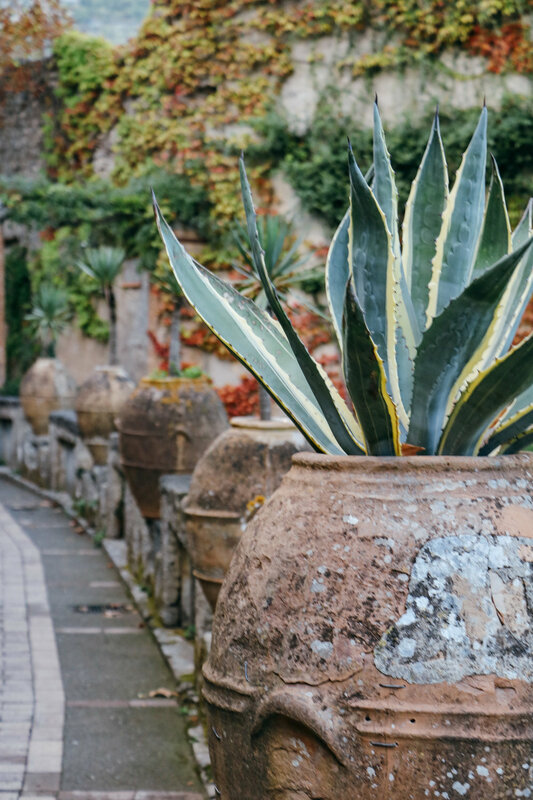 Picturesque walkways shaded by large overhanging trees and lined with colorful flowers lead visitors throughout the grounds with views of the Gulf of Salerno in every direction. Enchanting fountains, statues and pavilions add to the allure. It felt like somewhere out of a storybook. 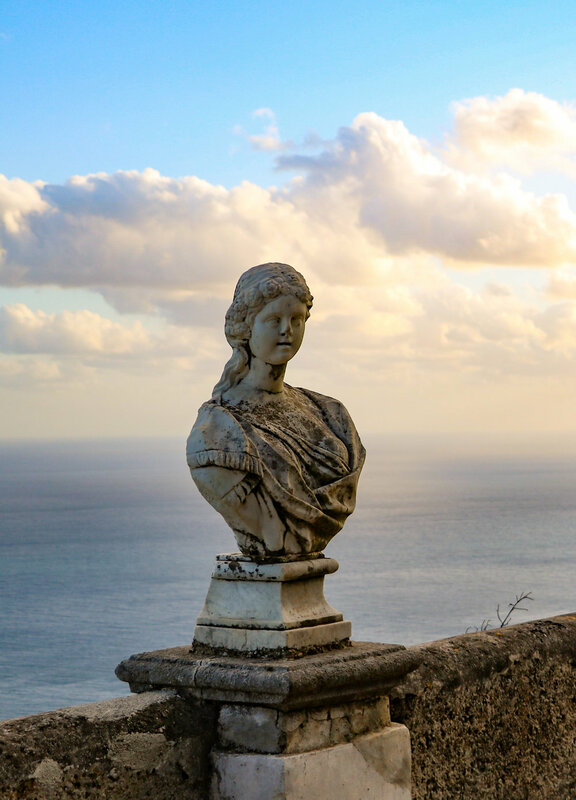 The highlight of the property is the Belvedere of Infinity, an awe-inspiring terrace lined with classical-style statues and busts overlooking the Tyrrhenian Sea. 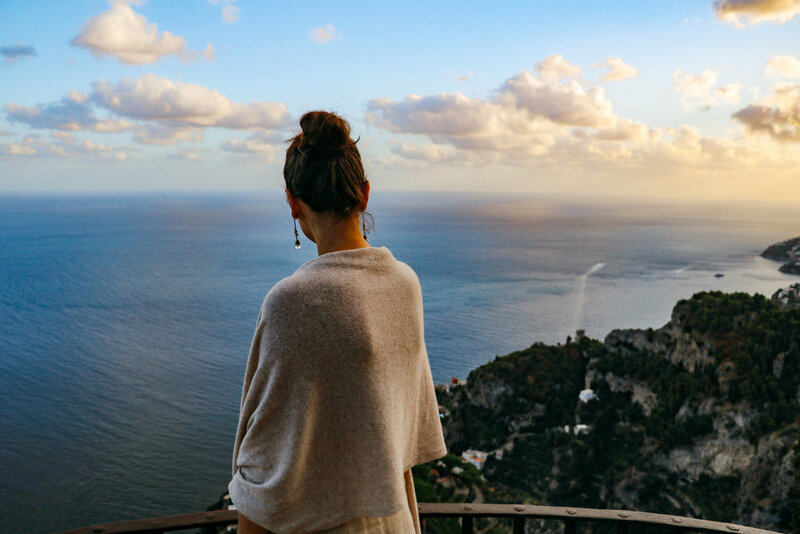 From here you can see the Amalfi Coast in all its glory; jagged mountains plunge into the blue water with little houses of all shapes and colors clinging to the hillside. It's a sight unlike any other! As unplanned as our visit was, we were fortunate to experience this view right before sunset when the soft lighting and clouds mixed to create a dramatic sky of blues and golds. It was stunning! The property is worth a wander, if for no other reason than the shamelessly romantic views, and tickets are only a few euro each and can be purchased upon entry. What I didn't realize until after we left is that the villa includes a five-star hotel, which goes to show how peaceful and quiet of an atmosphere it is. 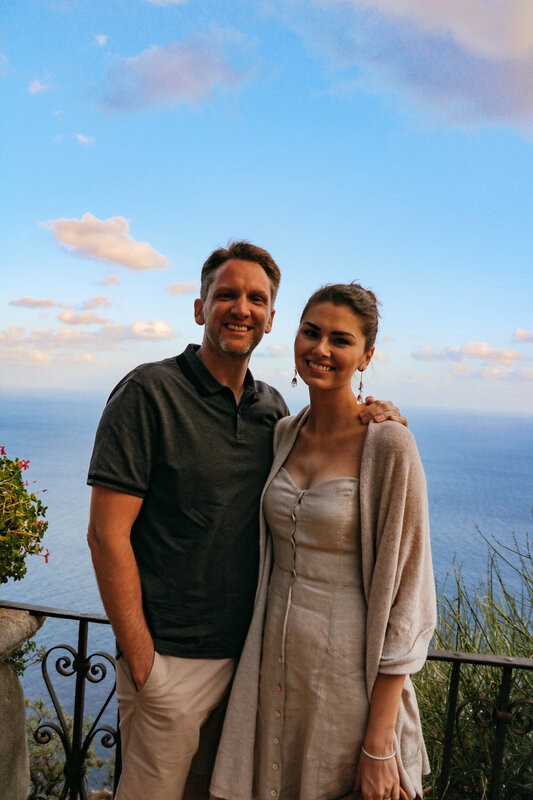 Though we were only in Ravello a very short time, the town captivated us and we would like to return one day and spend a few nights, finally getting to spend that whole day sitting outside a cafe like a local. If so, I bet we'll check-in to Hotel Villa Cimbrone!